Personal, Social and Emotional development- We have been talking about what makes us feel safe this week. This is linked to our whole school anti bullying week. 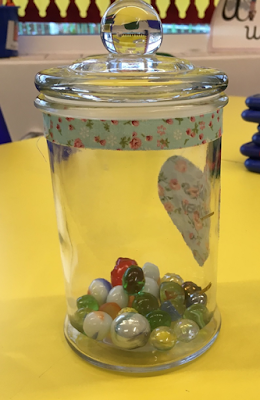 This week we have also introduced our marble jar and as a class we are trying to work as a team to earn marbles for being responsible and helpful members of the class. We have had lots of discussions about the sort of things that we need to do in order to earn marbles. The children had some great ideas and have already decided on what they would like their treat to be when we fill the marble jar to the first point. Communication and Language- This week we have continued to build on our storytelling and the use of expression when taking on a role. I have been really impressed by how well the children have remembered the story and have been able to tell it to others. Do go and have a look at the storymap we have made. We have also enjoyed having lots of discussions this week about the story and why we like or don’t like certain characters. Physical development-We have been working on our pencil control this week and it is great to see the chidlren’s fine motor control improving. Outside we have been moving like giants and thinking about big steps and small steps. We have also been working on our balance and co-ordination. Literacy-In our phonics sessions this week we have been practising our writing skills and in particular our letter formation. It is great to see how the children’s writing is improving week by week and it is even better to see them enthusiastic about writing and choosing to go and mark make at the writing area. Maths- We have been busy measuring this week, measuring ourselves on our new height chart, measuring different objects that we have found and comparing objects by height. In our whole class maths sessions we have been ordering different sized objects and using all the different words that we can think of to describe size. Expressive art and design- We have continued to be creative this week and have enjoyed finishing our painting of the Jack and the Beanstalk characters. Do go and look at them in the shared area. I am sure you will be as impressed as I was with the detail that the children have used in their paintings. For the next few weeks we will be learning the words to the songs that we will perform on our Nativity. I am sure that you will get to hear some of these being sung at home over the coming weeks! Understanding the World-This week we have talked about Children in need and why we raise money to support it. We have watched video clips about children and adults who are helped by the money raised by Children in need. As a class we have also talked about how we are fortunate and why it is important to think about others who are less fortunate. . We have also enjoyed observing the changes in the world around us and have been talking about the leaves on the tress falling and the colder weather. Christmas Nativity- We will be sending home a letter next week with details of costumes. Just to remind you that you need to check your child’s book bag every day for letters that are sent home and any notes in your child’s news books. Homework- Your child now has a new homework folder in their book bag. Please return their completed phonics sheets in their homework folder by Thursday each week. As the weather is getting colder please could you make sure that your child has a coat, hat, gloves and scarf in school everyday. These should also be clearly named.